After our most recent Office Field Trip to the offices of American Express, our first brand visit of the summer, I reflected on what I had learned throughout my brief career in partnerships. All of my experience had come from a property perspective, and so I looked to draw both similarities and differences between this realm and that of the agencies and brands that, through MSBA, I’ve begun to more properly understand. The first thing I took note of was that brands, just like properties, look to not only drive commerce, but to increase the quality of experiences that they provide to their customers. It can be easy to see an advertisement at a venue and assume a brand’s only desire is to increase its own awareness, but in reality, this kind of marketing is done mostly with the consumer in mind. 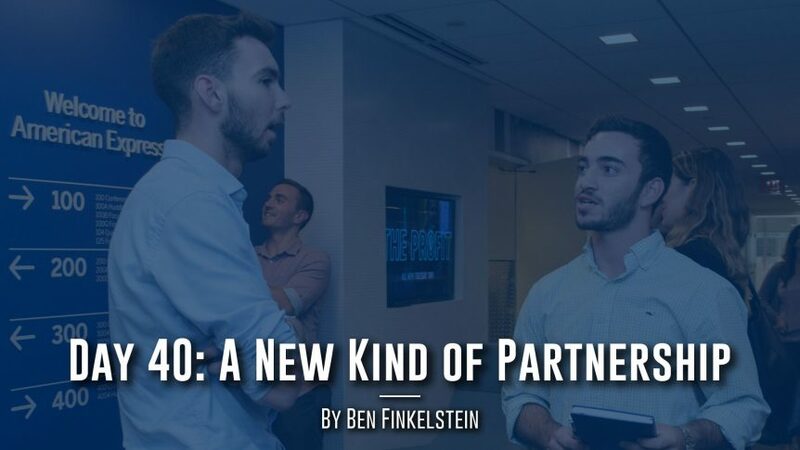 The second thing I realized was that partnerships are forged every day, and not just between brands and properties, but between individuals as well. Throughout the summer, representatives from the various organizations my classmates and I have been fortunate enough to learn from have constantly reminded us that our most important network is with each other. Though we are now a collection of interns and students, we’ll one day be a part of something much greater. When that time comes, it will be the partnerships we formed this summer with each other that matter most. In totality, MSBA has helped me redefine what a partnership is. Never would I have originally thought how vast the meaning of the word really is, much less that I would come to realize this by means of American Express. Regardless, my new definition feels much more wholesome now.